With multiple Seven Summit expeditions under their belts, our brother and sister team, John and Kate Gellert, now head far south for the trip of a lifetime as they make their attempt the summit of Antarctica’s Mt. Vinson. 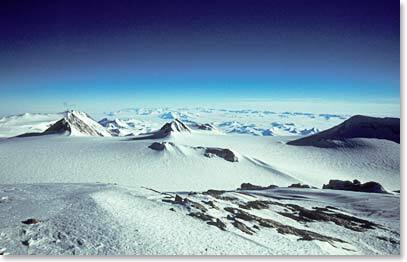 The unspeakable grandness and sublime space of Antarctica is unmatched and will offer these explorers a brief glimpse at the pure, empty soul of our planet. With Wally Berg as their guide, John and Kate will be faced with extreme isolation, bone-chilling cold, and punishing winds as they journey towards their goal—the summit of Mt. Vinson. This is the big one, and promises to challenge the limits of each climber’s endurance and ability. Follow the drama of this adventure through daily dispatches, coming soon. This entry was posted on Friday, November 19th, 2010 at 5:46 pm	and is filed under Vinson.